The search query specifies 7A as the central atom, defined with just three bonded (non-metallic) atoms. Initially, if no constraint on any cyclicity in the three 7A-NM bonds is made (and with R < 0.1, no errors, no disorder), the following result emerges. I have plotted the three angle variables using the X/Y axes above and used colour to indicate the third angle (red = ~180°, blue = ~90°). 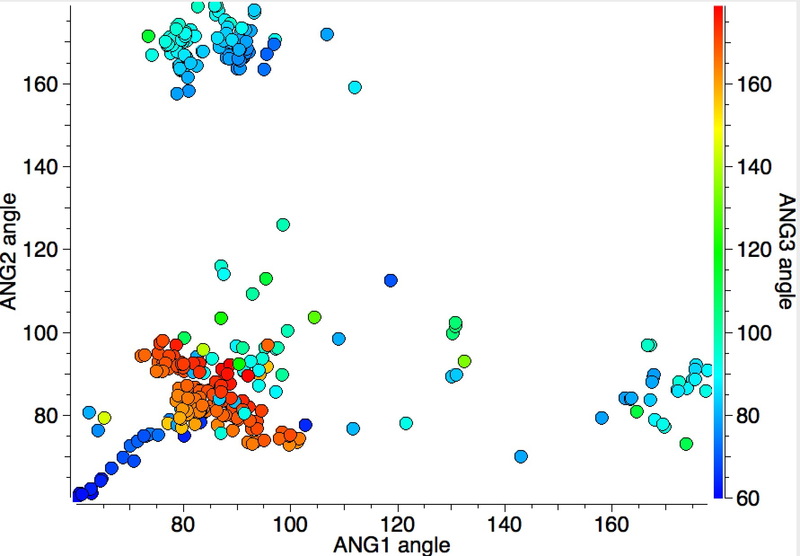 The clusters show that two of the angles are ~90° and only one is ~180°. There is also a set of blue points (~90°) which show a linear correlation and which can be shown to derive from cyclicity, as the plot below reveals when acyclicity is specified for all three NM-7A bonds. 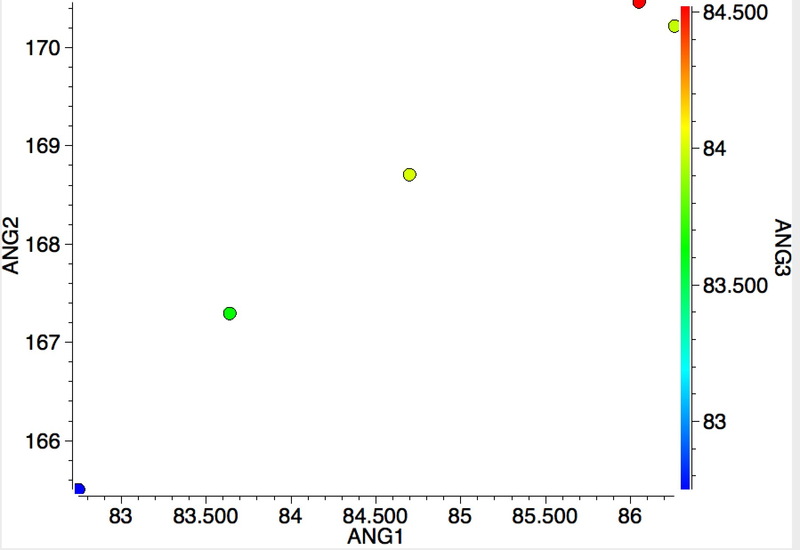 In this distribution, the two clusters for ANG1 or ANG2 of ~180° are small and compact, but the cluster where both ANG1 and ANG2 are ~90° is much more diffuse. 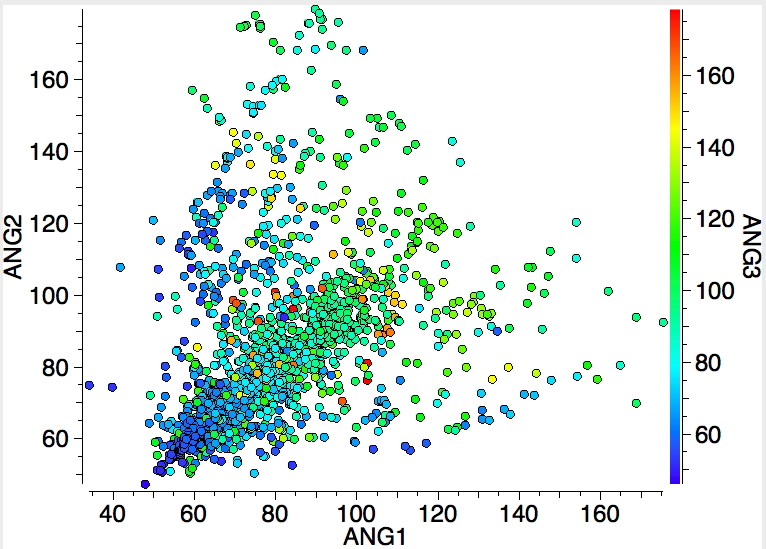 Not all of the points in this cluster show as red (ANG3 ~180°); there are a few cyan or blue examples here too; indicating all three angles are in the range 140-90°. This result is not arising from cyclic constraints. This wider look at 3-coordinate compounds in group 17 (the halogens) quickly reveals a class of such molecules where all three angles are relatively small. This suggests that a closer look at the bonding in these systems, especially in terms of VSEPR, might be rewarding! I end with an equivalent search for group 18 (the noble gases). Although the number of examples is small, all show the two small/one large angle so characteristic of chlorine trifluoride itself. The above is I think a good example of (big?) data mining, where one is searching for patterns, and if lucky spotting patterns that deviate from the norm to investigate the possibility of new chemical phenomena. It is also interesting to speculate upon the origins of why two of the clusters shown above are small and compact and the third is much more diffuse. This entry was posted on Friday, June 10th, 2016 at 8:26 am and is filed under crystal_structure_mining. You can follow any responses to this entry through the RSS 2.0 feed. You can leave a response, or trackback from your own site. 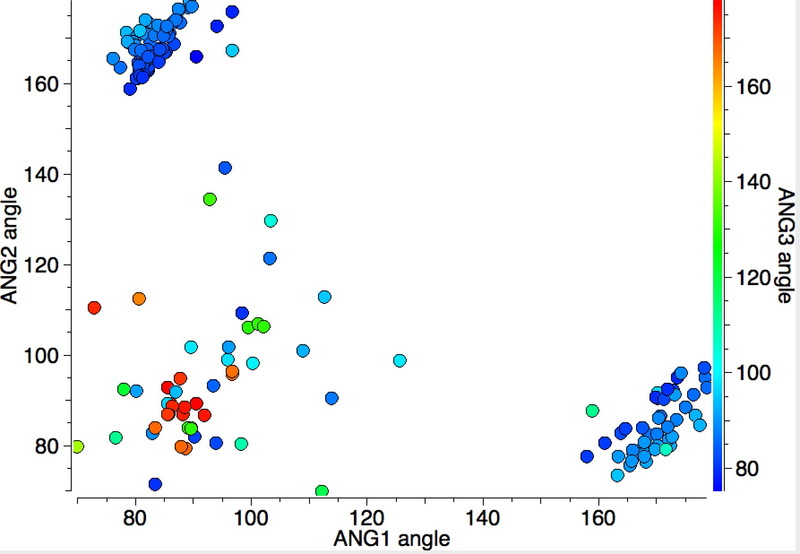 The scatter diagram above when constructed for NM (non-metal) ligands surrounding the group 7A central atom shows a great deal of structure with well defined clusters at specific angles. Below I show the effect of replacing a non-metal ligand with a metal ligand (and allowing the M-7A bond to be cyclic). It is surprisingly different with relatively few angles approaching 180°. 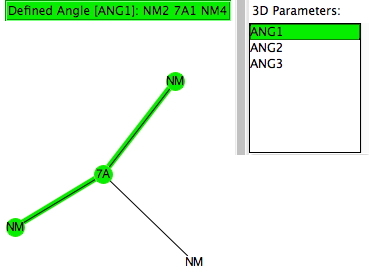 The strongest trend is a linear correlation between the three angles, which all get larger in concert, but with two arms where it appears two angles are constant and only the third increases.